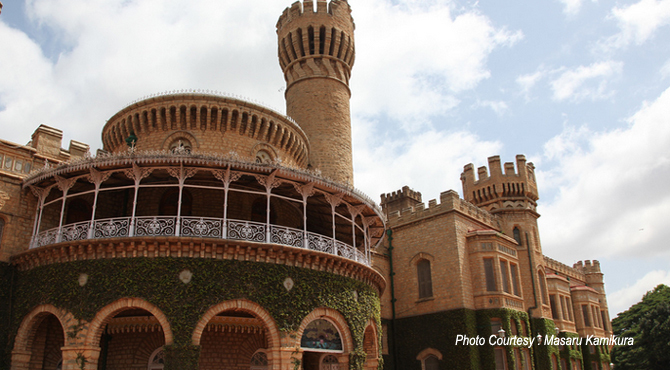 Inspired by the Windsor castle in London, Bangalore Palace was build in the Tudor Style architecture with Gothic windows, fortified towers, arches, battlements and turreted parapets. Situated in the heart of Bangalore city, near Sadashiv Nagar, this unique edifice was built by Rev. Garrett, first Principal of the Central High School, which is now Central College. In 1884, for Rs 40,000, it was bought by the then Maharaja of Mysore, Chamaraja Wodeyar who turned it into a luxurious manor. He imported stained glass and mirrors from England, manual lift and wooden fans from General Electric. He also has a fascination for stuffed animal's remains. The palace has bar stools with cushions made of deer and elephant legs. At the palace entrance one can see a massive elephant head mounted over the doorway. It is said that this tusker had killed many people and was therefore killed by the king's men. The palace spread over an area of about 430 acres with a built-up area of 40,000 sq. ft. A part of this palace being used as residence by the erstwhile royal family. Famous for its elegantly carved woodwork, it's interiors have awesome floral motifs, cornices, mouldings and relief paintings on its ceilings. Souvenirs and artefacts, door handles, latches, cast iron lamps, photographs of the royal family, sari etc will be sold as souvenirs to visitors. The family has also hree old buggies that will be available for joyrides. The ground floor of the Palace comprises of a massive open courtyard which has concrete seats covered with fluorescent blue ceramic tiles against the granite on all sides. Attached to this is a ballroom where private parties of the King used to be held. A staircase takes one to the Durbar Hall which has stained glass windows in Gothic style on one side and clear glass adorn the other. It also has the famous painting of a reclining lady by Raja Ravi Varma. From here, a rosewood balustrade takes one to the bedrooms used by the maharajas and their consorts. Earlier the vast open area of the palace used to be surrounded by beautiful gardens, and polo matches were conducted on the grounds. Today the palace ground is a popular venue for various exhibitions, concerts and cultural programs. After the last restoration in 1927, recently in 2005, work on the interiors of the Bangalore Palace and its gardens was taken up by the scion of the erstwhile Mysore royal family, Srikantadatta Narasimharaja Wadiyar. Mr.Wadiyar has put up his own personal collection of modern art in the Darbar Hall and some rooms in the Maharaja's Suite. One of the rooms has been converted into a boutique, where silks and garments are on display.